Posted on Mon, Feb 6, 2012 : 11 a.m. If you need a quick side dish to supplement a meal, sometimes mixes are just the thing to save you. I'm usually a girl who bakes from scratch. But I had so many things to do this past weekend and so many places to be that the fastest option was the option that won the day. Your son or daughter came home from school for the weekend, bringing a month's worth of laundry and an extra person to feed? You weren't expecting your children's friends to stay for an extended play date that suddenly includes dinner? A loved one isn't feeling well and needs some chicken soup, plus a little something to round out the meal? Muffins that can be made in 20 minutes, to the rescue! And how can you go wrong with Michigan's own Jiffy muffin mixes? Packaged just down the road in Chelsea, they're inexpensive and easy to use, always ready to be relied upon whether you use blueberry, banana or any of the others. Take a basic muffin mix, stir in a couple of extras and your last-second side dish may just end up being the star of the meal! Place the mix into a medium mixing bowl. Combine the milk and the egg; stir into the mix. Stir in the cheeses. Divide the batter among the lined muffin tins. 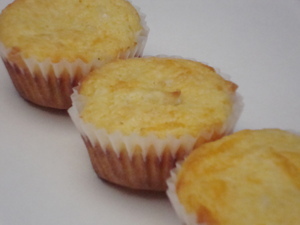 Bake for 12-15 minutes until a tester comes out clean and the muffins are golden. Tue, Feb 7, 2012 : 1:15 p.m. The Jiffy corn muffin mix also makes an awesome corn pudding by adding sourcream and creamed or regular corn to the above recipe--I've been making it for years. I use two boxes of the mix and a 13 X 9 pan. Some people like to add a small can of green chilis too. It's good! Tue, Feb 7, 2012 : 2:24 p.m.
Oooh, that would be so good! It's funny - I never make mixes just &quot;as is,&quot; but I've been told by others that they never think to modify them. So while this seems such a simple notion, it's always good to share the ideas with others. Another new dish to try now! This would be awesome with chili! Thanks! Mon, Feb 6, 2012 : 5:21 p.m. They would be great with chili! Truly, Jiffy mix saved the day this weekend - hooray for the local company!